Dr. Ashkan Moazzez is a renowned general surgeon in Torrance, California. He received his medical diploma from Tehran University of Medical Sciences, School of Medicine in 1998. 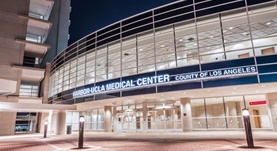 Dr. Moazzez completed his medical education with a residency in general surgery at the University of Southern California – LAC+USC Medical Center, a residency in general surgery at Huntington Memorial Hospital and a fellowship in minimally invasive/ bariatric and laparoscopic surgery at the University of Southern California. He is certified by the American Board in surgery and general surgery. His subspecialty is general surgery. This doctor works at Los Angeles County-Harbor-UCLA Medical Center and at County Of Los Angeles Auditor Controller. He was awarded the following honors: the honor ACS Fellow (meaning the Fellow honor granted by the American College of Surgeons), Recognition of Excellence in Medical Education, Association of Professors and Scholars of Iranian Heritage, Avicenna Award of Excellence in Medical Education and an honor granted by the Academy of Persian Physicians. He has published a lot of articles in cooperation with other doctors. He is a member of the American College of Surgeons.